There’s a moment, when the organ enters the “Organ” Symphony and the poco adagio section begins, which on this recording achieves a rare and very special magic. The bass line played by the organ, so well-captured by Reference’s spectacular engineering, rumbles and hums as if you are in a cathedral. Then the orchestral string section intones its melody, with the humble simplicity of a prayer. There’s a hushed early-morning-fog beauty to this moment, as you hear the violinists play as softly as they can, and at first you can hear them separately but as the theme unfolds their instruments blend together. It all transports me to a cathedral, not a concert hall. I don’t know that I can describe the feeling accurately but it’s one of those music-is-magic moments that even very good albums are lucky to have. The rest of the Kansas City Symphony’s performance of the “Organ” Symphony is very good too. Conductor Michael Stern leads a sort of middle-ground performance. It’s not a hyper-exciting, onslaught-of-energy account, of the sort that Charles Munch might lead (review ~ review ~ review), but it’s also never boring, not even for a second. Even more importantly, the Kansas City Symphony proves fully ready for its close-up. A recording as flawless as this is like high-definition for TV: you can see every bead of sweat on TV, and you can hear every false move on a Reference Recordings production. Only, as usual, there aren’t any. Reference also does a superb job blending the organ sound in with the rest, so neither overpowers the other. I don’t know if this is a “realistic” sound, because I’ve sat in some pretty bad seats at concert halls. This sound is, in my experience, better than realistic, pretty much the ideal balance, especially when the organ sends a bass note rumbling down the wire to my headphones. This is far superior to the recent Leonard Slatkin version with his Lyon orchestra (review), both as a performance and as an engineering feat. 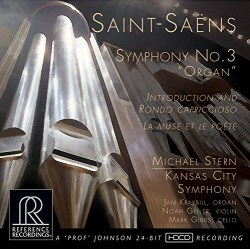 The two pairings are also concertante works, so this CD is an opportunity to meet three major KC soloists. Jan Kraybill, the organist, supervises the orchestra hall’s brand-new organ, and has recorded a solo album on it. Noah Geller, the orchestra’s concertmaster, contributes excellent solo playing to the Introduction and Rondo capriccioso, a virtuoso-type piece that was once a favourite of players like Perlman. It deserves to make a comeback. Even more obscure is La muse et le poète, a sixteen-minute tone poem with violin and cello solos. Written in 1910, when Saint-Saëns was 75, the piece in a rather literalistic way assigns the violin to play the Muse and the cello to be the Poet. La muse begins with a dreamy, slow “once upon a time” introduction. There is even a big sweeping gesture on the harp, which is a little distracting as the harp is so spotlit by microphones that it sounds like a third soloist. The violin and cello converse as regularly as if the piece were a double concerto, and the action gradually builds to an outright allegro about halfway through the piece. You can plainly hear many echoes of the Saint-Saëns who wrote two of our most beloved cello concertos. I’d recommend this highly if you need an Organ Symphony in top-quality sound. It’s not surround-sound, but that’s probably okay given the precision and the unmatched skill with which Reference has presented the musicians. Oddly enough, though, the sound is my biggest problem with the album: as well as the harp quibble above, something seems to have gone wrong in the Introduction and Rondo. There’s an occasional swishing sound, like the violinist wore a big floppy sleeve made of a light fabric. Nobody else who reviewed the CD has noticed this, so maybe my copy is the only one affected. At any rate, there are no sound problems at all with the symphony. If this repertoire and release tempt you, go for it. If this release doesn’t tempt you, why are you reading the review? Add it to your wishlist anyhow. You should at least hear the rare La muse.